Fundamentally, oscilloscopes are time-domain instruments: We use them to acquire signals from our circuitry or device under test, and the instrument displays them in the time domain. We see the voltage of the signal in the vertical axis, and we see how that voltage changes over time in the horizontal axis. In the time domain, there are numerous figures of merit we can use to characterize our signal. For example, if we're talking about a sine wave, these might include parameters such as frequency (instantaneous and mean), amplitude (average and peak-to-peak), offset, RMS value, standard deviation, period, and more. But what about the frequency domain? There, too, the signal has a few useful figures of merit. The fundamental mechanism that an oscilloscope deploys to translate information from the time domain to the frequency domain is the well-known Fourier transform. 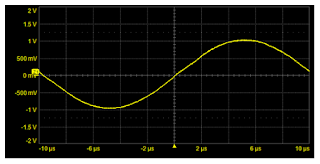 The version used in an oscilloscope to convert from the time domain to the frequency domain is the discrete Fourier transform (DFT). In this case, a fundamental assumption is that the waveform is repetitive. If, for example, our timebase is set at 2 μs/div, the acquisition window, as in Figure 1, has a total width of 20 μs. We assume when we perform a DFT that what happens in that 20-μs span repeats identically every 20 μs. We can use the results of the discrete Fourier transform to identify our signal's frequency components. There are, however, some restrictions. The most important restriction is that the discrete Fourier transform will allow us to identify only harmonics, i.e., multiples of the first harmonic frequency, which is 1/acquisition window. Thus, the acquisition window, which in our example of Figure 2 is 20 μs, defines the lowest frequency that we'll be able to calculate for this waveform. Using 1/acquisition window to determine the frequency, 1/20 μs = 50 kHz. That tells us that we'll only see frequency components that are multiples of 50 kHz. When we take that periodic waveform and assume it repeats over and over for this time interval of 20 μs, we can then calculate the harmonic amplitudes. As we've seen, the lowest frequency component is the first harmonic (1/20 μs = 50 kHz), and the spacing between the frequency components is also the first harmonic. The next frequency component we'll resolve is 100 kHz, then 150 kHz, and so on. The only problem with the discrete Fourier transform as a pathway from the time domain to the frequency domain is that when you have a very large number of data points, it takes a long time to calculate. The way around that issue is to use a mathematical trick known as the fast Fourier transform (FFT). We'll look at the FFT in an upcoming installment.